In these latter days of Insta-fame and wheelie control, it’s easy to forget what motorcycles have always been about: freedom, friendship, and fun. Today, we’re proud to present a custom bike built with just these priorities in mind. 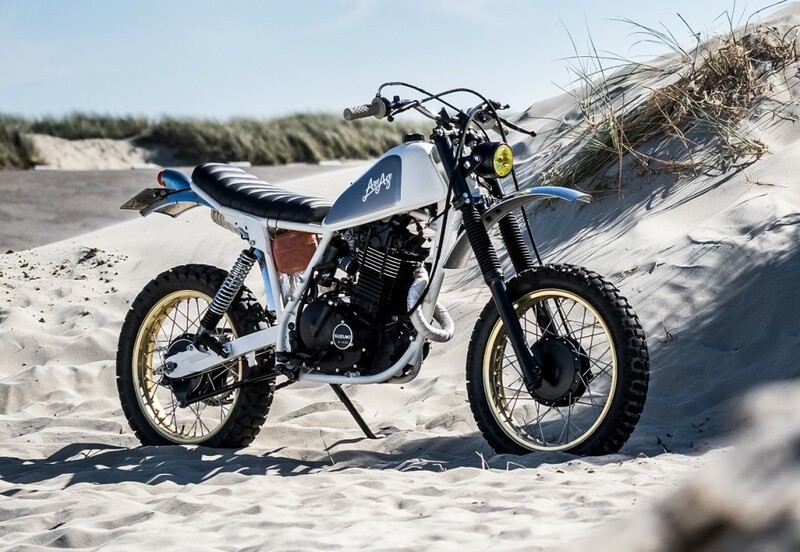 This Suzuki DR500 “Surf Tracker” is the work of Roy Holtman of RH Motorcycles, a motorcycle design studio/atelier based in the Netherlands. 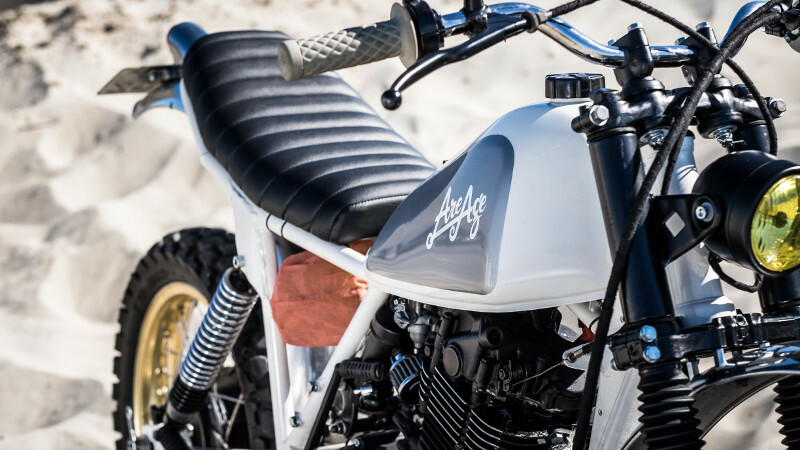 Roy combines an education in art/design with a lifelong passion for two wheels. 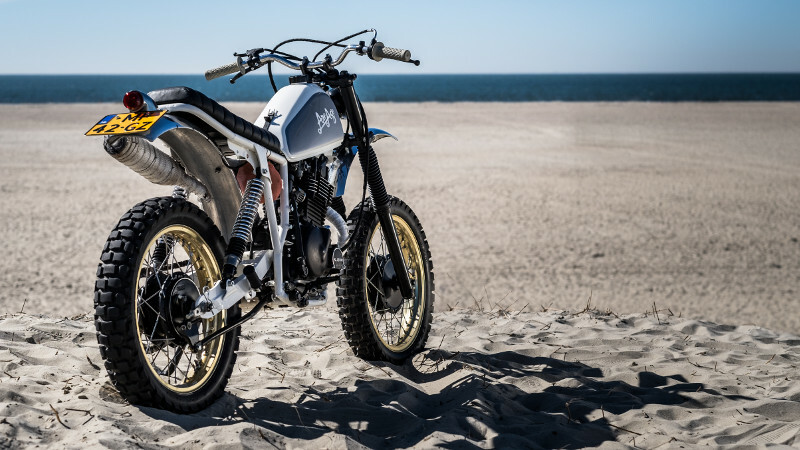 Recently, we featured Roy’s Yamaha “MT660” Scrambler. 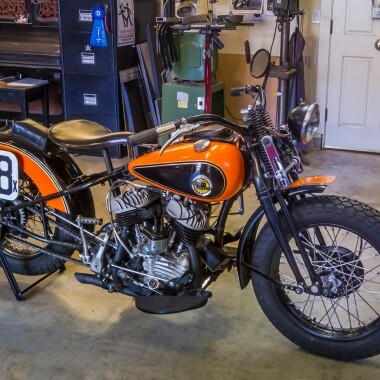 Today, we’re going to take a step back and look at one of Roy’s early, personal hobby builds. 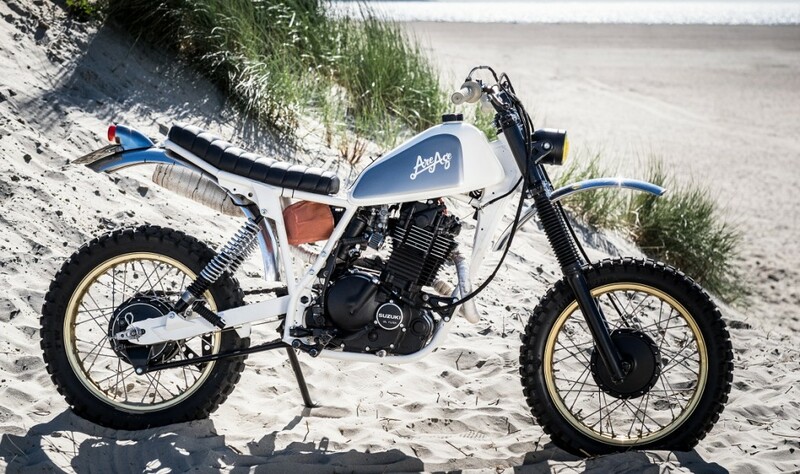 A few years ago, Roy found himself wanting a classic dirt bike for surf/moto trips like Wheels & Waves in Biarritz. 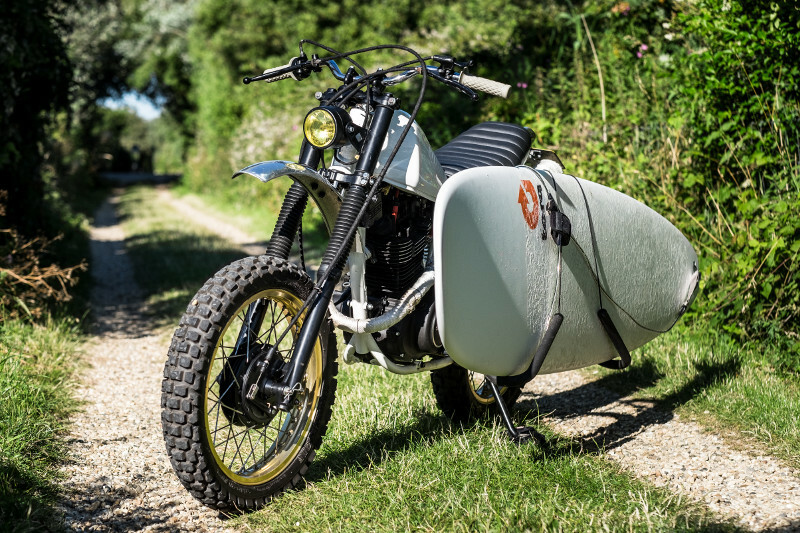 A bike he could ride from the camper or shop van to the beach with his surfboard in tow. 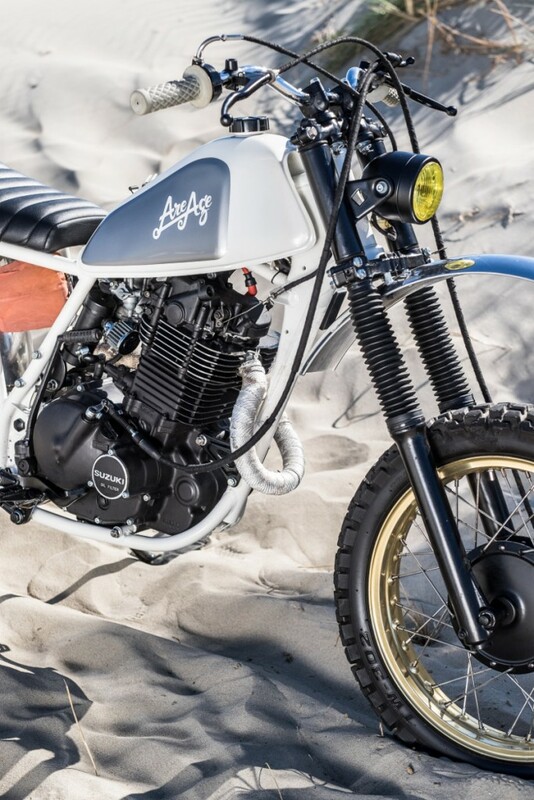 He credits Deus Customs as an inspiration for the build — after all, Deus has been instrumental in bringing back the combined surf/moto lifestyle of the 60s and 70s. 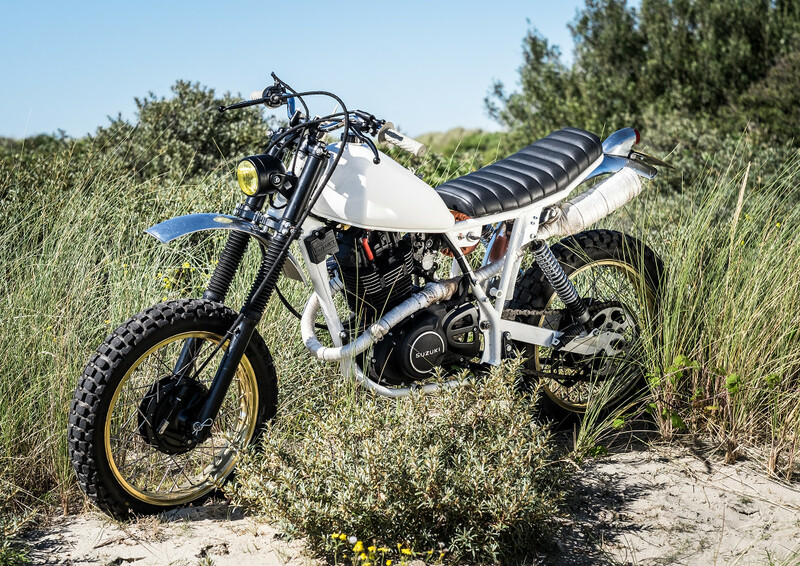 This DR500 was Roy’s last hobby build before going pro, and it looks like a handful of fun. 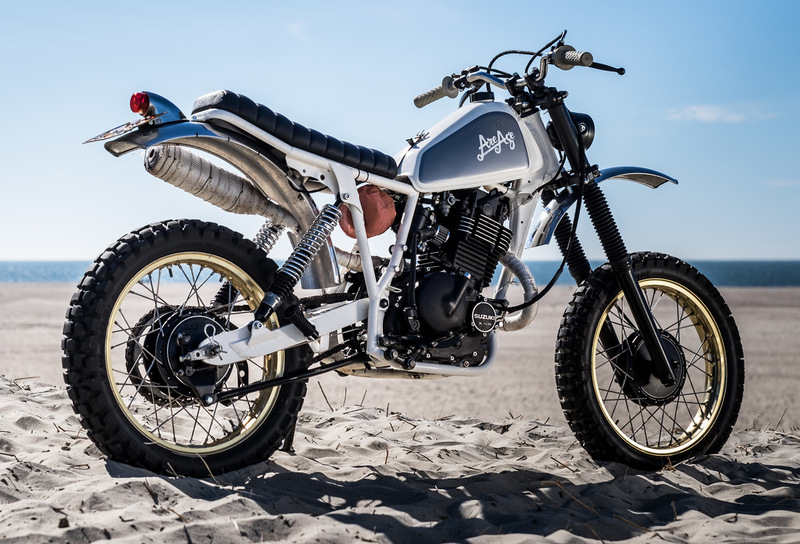 Below, we get the full story on the build, along with some killer photos from Mark Meisner. 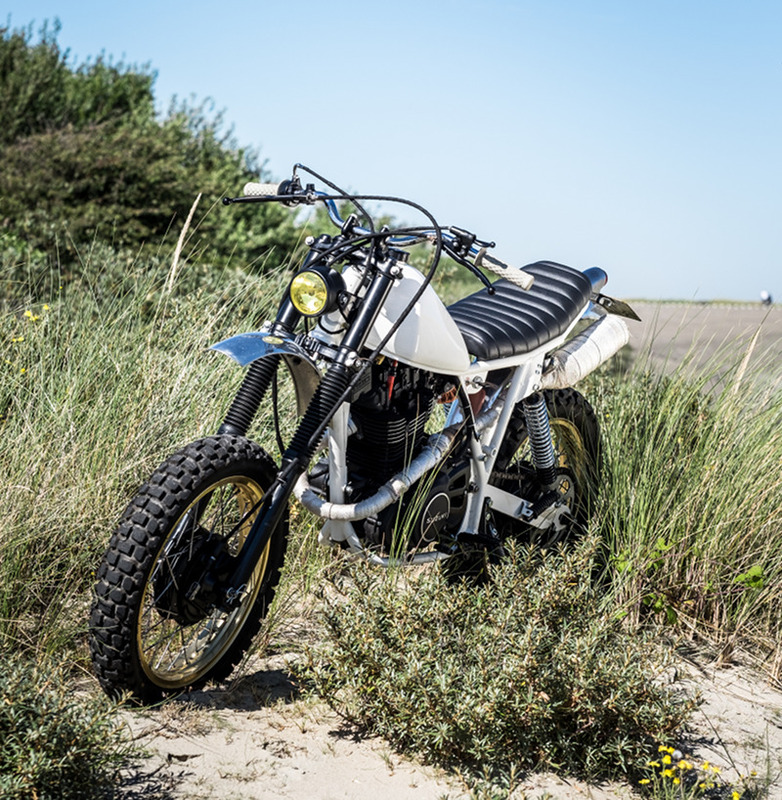 Started building for fun in the living room, now I run a motorcycle design studio/atelier in Arnhem, the Netherlands, RH Motorcycles, specializing in handbuilt, bespoke, custom motorcycles, parts and lifestyle. The signature “ARE AGE” brand logo is a self-deprecating reference to the Dutch accent when pronouncing the initials of his name. Right before going full time pro. My last (first pro) hobby build. Inspired on the Endless Summer philosophy. Came with a surf rack to take me from the shop van (camper) to the surf during trips back in 2015. Among others, Wheels and Waves 2015. It just was a good-time bike for me! Personal build at that time. 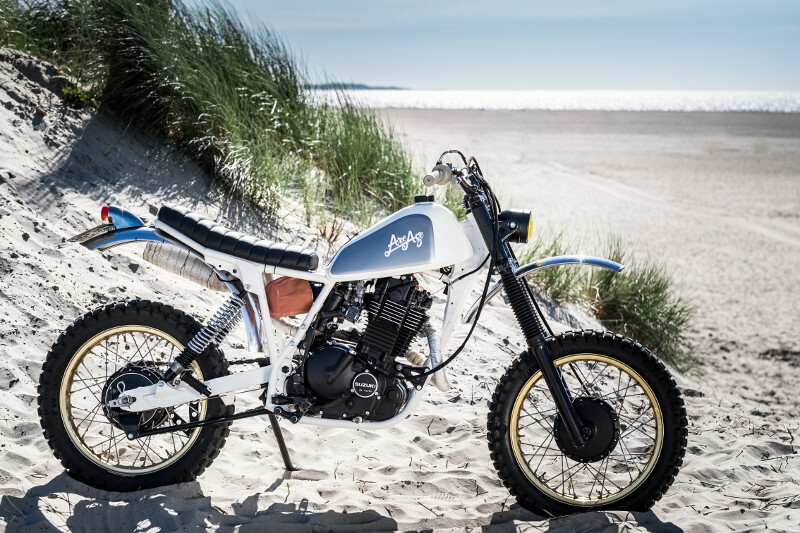 Built for vacation, surf trips and random good times on a old small classic dirt bike. Influenced by DEUS for sure. Surf and moto lifestyle, and most of all having fun! Built in 2014/15. – Single headlight with yellow glass. – Stainless steel front and rear fender. I wanted to make a visible gap between the seat and tank! Which could not be done with the original mounting bracket. – Custom painted tank, with on one side a “look-like-bare-steel” oval (inspired by the aluminium XT500 tank) with the AREAGE logo. – Twinair open air filter with fine-dust cover. – Oil catchcan and filter as crankcase breather. 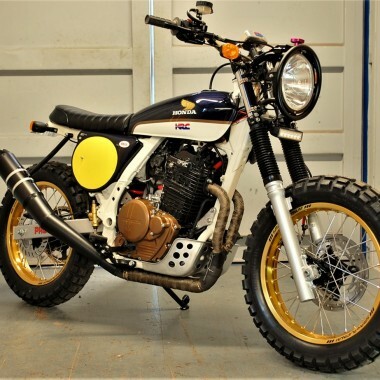 – Complete heat-wrapped exhaust and shortend old-skool off-road BSM muffler. 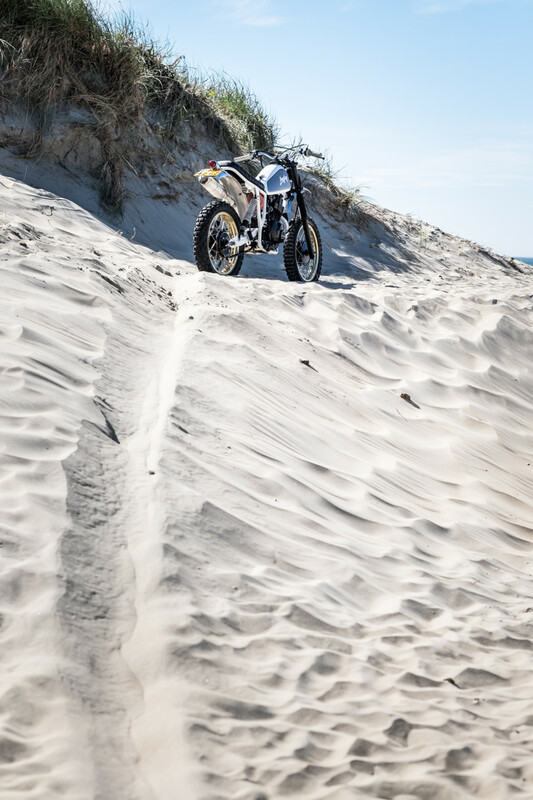 – I also did shave the frame and forks but don’t exactly remember what…. Having the guts to create the gap between the tank and seat! You still either love it or hate it! Harley-Davidson WR / WRTT "Leonard Special"
Surf Tracker, I likes it, except for the mummified exhaust but I guess in this case it has to be.